Book cover for "Rise of the Rocket Girls" by Nathalia Holt. 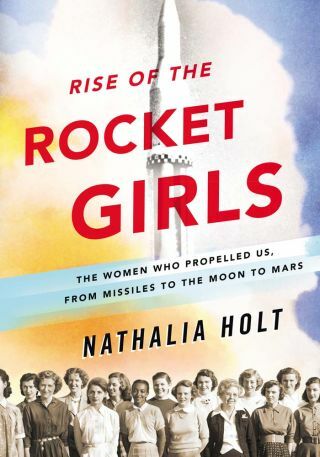 Nathalia Holt is a science writer and author of NY Times bestseller "Rise of the Rocket Girls: The Women Who Propelled Us from Missiles to the Moon to Mars" (Little, Brown and Co., 2016) and "Cured: The People who Defeated HIV" (Plume 2015). Her writing has appearedin the New York Times, the Los Angeles Times, The Atlantic, Slate, Popular Science, and Time. Holt contributed this article to Space.com's Expert Voices: Op-Ed & Insights. This excerpt is from "Rise of the Rocket Girls:" by Nathalia Holt. For more on the unsung women heroes of the Space Race, read Holt's exclusive Expert Voices Op-Ed "Lost in Space Race: Women Denied Proper Place in History." Holt will be in Washington, D.C., on April 20 at 6:30 p.m. EDT for the first "It's Science! With Politics & Prose and Space.com" event, which is free and open to the public. See the Politics & Prose calendar for details. This excerpt is provided by Little, Brown and Company, Copyright © 2016 by Nathalia Holt. All rights reserved. The first noise she heard was a low-pitched growl. Next came the explosion. Then the grating sound of metal grinding on metal came as loud as a thunderstorm. Barbara Canright whirled around to see a car-size piece of twisted steel teetering dangerously on the roof of the building above her. With her eyes fixed on the looming accident, the seconds slowed down as she stood frozen in place. Filled with a sudden terror, she hurried away, her heels clicking on the red-brick paths of the California Institute of Technology campus. A blur of faces surrounded her, all gawking at the scene, unsure of exactly what they were witnessing. But Barbara, known by everyone as Barby, knew what the thing falling from the sky was. From a safe distance she watched as the warped hunks of metal rained down on the sidewalk. One after another, a platform, a rocket motor, and a pendulum fell to their doom. The homemade scientific equipment landed in a heap resembling little more than trash to the onlookers. Yet Barby could value its worth. She gasped when a piece of the building followed the debris to the ground, the bricks breaking apart into powdered clay. When the dust settled, the campus seemed impossibly quiet. As Barby moved away from the scene, the students around her were whispering; it was as if after so much noise, they hesitated to add a decibel. Barby often had lunch with her husband in the afternoons. She'd escape the shackles of her typewriter and walk across the campus, drinking in the fresh air and the Southern California sunshine. Yet this March day in 1939 was unusually overcast. It was a foreboding beginning to the experiments that a team of men, known as the Suicide Squad, would run that day. The group drew attention the way a circus attracts a crowd, with outlandish stunts and an eccentric appeal. It all started with three young men: Frank Malina, Jack Parsons, and Ed Forman. Hardly anyone thought of them as scientists. Perhaps this was because only Frank was a student at the university. It was difficult for those first meeting him to guess his age. He had the exuberance of a boy but the thinning hair of middle age. Despite his retreating hairline, he was twenty-six years old, the same age as Ed, and he shared a birthday with Jack, who was just two years younger. Together they tackled rocketry with all the bravado of youth. Ed and Jack had been best friends since attending Washington Junior High School in Pasadena. Jack was the chemist in the trio. He grew up on the posh "Millionaire's Mile" in Pasadena with the expectation that, despite his poor performance in school, he would attend college. The Great Depression changed his destiny, leaving his family and his career prospects desolate. Ed, on the other hand, was from humble origins. His background in a working-class Pasadena family gave him experience in cobbling parts together. The machinist of the group, he made the modest equipment they had go a long way. The two bonded over a love of science fiction and rockets. It was this passion that led them to Frank. Nathalia Holt, author of "Rise of the Rocket Girls"
For Barby and her husband, Richard, the group held no mystique; they were simply their friends. They met on the Caltech campus, where the Suicide Squad, despite the nonstudent status of two of their members, spent all their free time tinkering with rockets. As they sat around a wicker-and-glass table on the Canrights' patio, their imaginations fired late into the night with only the moon keeping track of their hours as it rose in the sky. The California moon seemed impossibly big. Barby had never seen one like it back home in Ohio, where in the warmth of the summer nights, everyone hid behind screened porches to shelter from the mosquitoes that descended at twilight. In the sleepy town of Pasadena, Barby, Richard, and the members of the Suicide Squad had a clear view of the stars from their backyards. Since the Great Depression, the number of businesses was shrinking, down 52 percent in the decade since 1929. One benefit of the sluggish economy was that there was less light pollution in the night sky, leaving a velvety-black canvas for their starry-eyed schemes. As the friends discussed airplanes, Barby found the conversation infectious. She was full of the naïveté of nineteen, and spaceflight seemed an attainable goal to her. They discussed everything, from fuel to fins. The Suicide Squad men were dreamers, but they were also troublemakers. The previous year, they'd tried to move a cylinder of nitrogen dioxide from outside the chemistry building. The valve suddenly jammed, causing a fountain of toxic, liquefied gas. For weeks, the resulting brown patch of grass on the lawn irritated the university's gardeners but made Barby smile as she passed it on the way to work. Unfortunately the next experiment wasn't as funny. The group were attempting to test an unusual mixture — nitrogen dioxide and wood alcohol — to see how the combination might power a rocket motor. Barby was appalled. Thanks to her proficiency in high school chemistry, she knew how dangerous nitrogen dioxide was. Inhaling the gas can kill you. To mix it with a cheap alcohol and then set it on fire was a death wish. Barby shook her head; the men were certainly earning their reputation. They took the dangerous mixture and poured it into a small rocket motor. They then attached a fifty-foot rope with the rocket motor swinging off the end and hung the pendulum in a stairwell from the top floor of the Guggenheim Aeronautical Laboratory, all the way to the basement, like a giant rope swing. How hard the pendulum swung translated into how high a rocket might one day fly. But it didn't go so well. The first time they tried their experiment, the engine misfired and a cloud of toxic gas saturated the building. It caused every metal exterior it touched to rust and tarnished every polished surface. The building housed an expensive new wind tunnel, the largest in the world, and its once-shiny metal was soon covered in spots of orange and brown. It looked like the wind tunnel had a case of measles. The accident earned the men the moniker the Suicide Squad, a nickname that didn't bode well. The group worried that their future at Caltech was as ruined as the rusted wind tunnel. Although Ed and Jack were not students, their future in rocketry was inextricably linked to the university. So it was a pleasant surprise when they learned that they could continue their experiments; they just had to move them outside. Using a metal platform attached to the side of the building, they hauled up their rocket-motor pendulum and carefully hung it over the side of the platform. When Barby looked up at the explosion that March afternoon, she was watching the platform carrying all the equipment smash into bits. It could have been worse — Frank could have been killed. At the last minute, he had been called away from the experiment to deliver a typewriter to his adviser's home, while Ed and Jack carried on alone. Returning to campus, he found a piece of the pressure gauge buried in the wooden beam right where his head would have been. This accident, in full view of the student body, brought renown to the Suicide Squad, though it wasn't a desirable notoriety. Barby and Richard teased the group mercilessly. As easy as it was to joke about the accident, Richard was seriously grateful Barby had been nowhere near the platform when it fell. Richard and Barby loved each other in the passionate fashion of newlyweds, the years not yet smoothing the sharp edges of their union. They fought and made up, the tears and laughter running together. They had eloped, celebrating their tender young marriage by moving from Ohio to Southern California. Richard was twenty-one. Barby was two years younger and turning heads at the all-male Caltech campus. With her dark hair curling at her shoulders, dark brown eyes, and petite, feminine frame, she was the very picture of a wholesome midwestern girl. She had just the kind of job one would expect. She worked as a typist, spending her days clicking away at the keys, while fitting in classes at Occidental College, in Los Angeles. She was incredibly bright; in high school she took advanced math and chemistry classes, often the only girl in the rigorous courses. As she toiled in school she had no sense that the coursework would ever influence her future. She took the classes simply because she enjoyed them and spoke of mathematics lovingly. Despite her teenage fascination, she was snarled in the limits of being born a woman. None of the options before her — schoolteacher, nurse, secretary — felt quite right. Yet whichever career she chose could hold only a transient charm. Now that she was married, her days of working would last only as long as she and Richard remained childless. Motherhood, the career she was formed for, loomed large. Richard, like Barby, was also discontented with work. To make ends meet, he drove a truck for a delivery company while attending graduate school at Caltech. Unlike Barby, he could see opportunity on the horizon. He wanted to be an engineer and knew that if he worked hard enough, he could get there. What Barby and Richard didn't realize was that while they joked around with the Suicide Squad, their fates would end up tied to the wild group. In less than a year, Frank would approach them with a tantalizing job offer. In 1939, the National Academy of Sciences awarded a grant to the Suicide Squad, now more formally known as the GALCIT (Guggenheim Aeronautical Laboratory at the California Institute of Technology) Rocket Research Project. It came just in time. Without a way to fund their rockets, the group had been on the verge of disbanding. Jack and Ed had taken part-time jobs with the Halifax Powder Company while Frank began research for the Soil Conservation Society. That first award, $1,000, rescued the group, bringing them back together. When they were awarded a second grant the next year for ten times as much, it was life-changing. It was the U.S. government's first investment in rocket research. In deference to the Army Air Corps, which had proposed the funding, they changed their name to the Air Corps Jet Propulsion Research Project. Their goal was clear: develop a rocket plane. The risky project was the beginning of what would become the Jet Propulsion Laboratory. The influx of money meant that the group could finally hire some help. Knowing they would need skilled mathematicians, Frank approached the Canrights. Barby knew the job would be far from a sure thing. She wondered if she could depend on the longevity of the reckless group. She and Richard would be leaving good jobs to work for men who were not known for their reliability. Yet the offer was tempting. If she accepted, Barby would once again be the only woman in a group of men. It was a job she hadn't expected, yet one she was eminently qualified for. Math was a comfortable second skin. She would always feel more at home with a pencil in her hand than at a typewriter. In addition, the position held prestige, allowed her to work alongside her husband, and paid twice what she made as a typist. More than the money, it offered her the opportunity to use her neglected math skills. It wasn't just the rocket research group that Barby was becoming a member of. She was joining an exclusive group whose contributions spanned centuries. Before Apple, before IBM, and before our modern definition of a central processing unit partnered with memory, the word computer referred simply to a person who computes. Using only paper, a pencil, and their minds, these computers tackled complex mathematical equations. Early astronomers needed computers in the 1700s to predict the return of Halley's Comet. During World War I, groups of men and women worked as "ballistic computers," calculating the range of rifles, machine guns, and mortars on the battlefield. During the Depression era, 450 people worked for the U.S. government as computers, 76 of them women. These computers, meagerly paid as part of the Works Progress Administration, created something special. They filled twenty-eight volumes with rows and rows of numbers, eventually published by the Columbia University Press as the plainly named Mathematical Tables Project series. What they couldn't know was that these books, filled to the brim with logarithms, exponential functions, and trigonometry, would one day be critical to our first steps into space. The dream of space exploration was what initially tugged at the Suicide Squad. They worked on engines during the day, but at night they talked about the limits of the universe. Even before they received federal funding, their group attracted new members. In 1936, Caltech graduate students A.M.O. Smith and Hsue-Shen Tsien joined the Suicide Squad. The lure of being part of the audacious gang was so great that Weld Arnold, an assistant in the astrophysics department at Caltech, bribed his way in by offering Frank their first (unofficial) funding, $1,000, in exchange for his role as photographer. The first installment, $100, was paid in a wrinkled wad of oneand five-dollar bills, delivered by Weld on a bicycle. No one questioned where he got the money; they were only too happy to have some. The group made fun of the alien spaceships they saw in the movies, laughing at their implausible designs, while simultaneously relishing a screenplay Frank had outlined in which rocket scientists were, of course, the heroes. Wrapped up in their fantasies, the team talked endlessly about their version of a spaceship: a rocket plane. But before they could build a plane they had to find a new place to work. The Suicide Squad's amplified destruction had gotten them kicked off the Caltech campus. They drove up into the deserted hills, choosing for their own a dusty canyon called the Arroyo Seco. Although only a few miles outside Pasadena, it felt like a world apart. They were far from prying eyes, the walls of the canyon screening their experiments from the outside world. The canyon itself was seen as some kind of monster by the town below. Although Southern California seemed to offer a constant supply of sunshine, occasionally the clouds gathered and the rain came down hard. When it poured, the watershed of the Arroyo Seco filled, funneling down to the homes and businesses below and causing flash floods. The residents of Pasadena cursed the canyon and decided to find a way to control the rages of nature. In 1935 the WPA began building a maze of concrete channels, transferring the power of the untamed tributaries to human hands. The once-wild Los Angeles River, now lined in concrete, was cut down to a trickle, dripping down the valley. The streams and riverbeds became nothing more than dusty indentations in the land (in Spanish arroyo seco means "dry streambed"). While the Arroyo Seco felt remote, far from any residential area, it was still a relatively quick drive from Caltech, where the Suicide Squad kept their equipment. The downside was that its dry, rocky landscape dotted with scrubby brush made it particularly susceptible to wildfires. Of course, concern over sparking fire would hardly deter the Suicide Squad from lighting up the night sky. They began to carve out a home in the isolated canyon and adapted their experiments to match. The group was lean, with Theodore von Kármán, Frank's graduate-school adviser, acting as director, and Frank as chief engineer. The Canrights joined the group along with a few new engineers and found that the dry stream made a perfect bed for firing rockets. They dug test pits and built a few small buildings to house equipment. Despite the developments, the area was still the wilderness to Barby. The dust covered her shoes and got in her hair. The grit found its way into everything — her car, her purse, even her lipstick. Grime notwithstanding, the team was content. The remote canyon concealed their loud, often-dangerous experiments, yet their isolation heightened their eccentric reputation. Hidden in the hills, tinkering with explosives, they were often perceived as mad scientists. Rockets were considered fringe science, and the people who worked on them weren't taken seriously. When Frank asked one of his professors at Caltech, Fritz Zwicky, for his help on a problem, the teacher told him, "You're a bloody fool. You're trying to do something impossible. Rockets can't work in space." In fact, the word rocket was in such bad repute that the group purposely omitted it when they formed their institute, the Jet Propulsion Laboratory. Some scientists at the sister Guggenheim Aeronautical Laboratory at the Massachusetts Institute of Technology snickered at them, while Vannevar Bush, an engineering professor at MIT, derisively said, "I don't understand how a serious scientist or engineer can play around with rockets." Before World War II, the idea existed only in laboratories, notably those of Hans von Ohain in Germany and Frank Whittle in England. With jet engines for airplanes still in the experimental stages, the idea of a rocket-powered plane seemed overwhelmingly naïve to experienced aeronautical engineers. A rocket engine would be even more complex than a jet engine because, although it worked on the same principle, the rocket engine didn't use oxygen from the air to combust its fuel. Instead, it carried its own oxidizer, making the mechanism intricate and heavy. Despite the outlandishness of their ideas, Frank and his team pursued their rocket plane in earnest. Frank detailed his hopes for the plane when writing home to his mother, describing with precision the technological hurdles they'd have to overcome. His mother, a piano teacher who instilled in him a love of music, could hardly keep up with the science but marveled at the audacity of his work. Frank's mother might not understand why he wanted to build a rocket plane, but she was proud of him. Although she was born in the United States, her family, like Frank's father, was from Czechoslovakia. Frank's parents met while playing in the Houston Symphony Orchestra and hoped to raise a family as devoted to music as they were. When Frank was seven, they moved back to Czechoslovakia, spending five years in Moravia. Between music lessons, Frank sketched balloons and airplanes, his dreams of flight punctuated by the compositions of Verdi. Under his pencil, science and art were intimately joined, forming a basis that would influence him his whole life. When Frank was twelve, his family moved back to the United States, and he found himself in Brenham, in east-central Texas, surrounded by corn and cotton. Life in the small town could be trying for an adolescent. Frank was teased for almost everything he inherited from his dad, from his complexion to his last name. When he received his degree in mechanical engineering from Texas A&M, his mother knew he'd leave Texas and never come back. He soon proved her right, departing to pursue his PhD at Caltech. It wasn't the musical career that his parents had wanted for him, but his upbringing had planted within him the seeds of artistry, patiently sitting dormant until they were ready to bloom. Barby felt a kinship with Frank. They had both left their families behind. Neither wanted to move back home, yet they both missed their mother terribly. Every week, they wrote long letters home. Frank's letters were almost like a diary. He recounted with scientific precision his feelings, thoughts, and actions. Barby's letters, on the other hand, were filled with the feminine details she knew her mom loved. In addition to dances and dinners, Barby was excited to share with her mom news of the government funding streaming into the newly formed institute. But not everyone was delighted with JPL's new military backing. Jerome Hunsaker, who headed the aeronautics department at MIT, was dismissive. "Von Kármán can take the Buck Rogers job," he said. Hunsaker's group was working on deicing plane windshields, a far more respected assignment in aeronautical engineering, albeit less flashy than what JPL was about to try. The "Buck Rogers job" Hunsaker ridiculed was that of developing the long-dreamed-of rocket plane. But the army didn't want rockets to explore the limits of Earth's atmosphere. Instead, they needed them to propel heavy bombers into the air from the short runways on aircraft carriers. The bombers didn't have enough thrust to achieve such a feat on their own. Thus, the audacious project could be summed up with one question: Could Frank and his team strap rockets onto a plane? Barby was sitting at a lunch counter when she first heard the term "JATO." Frank explained to her that it stood for "jet-assisted takeoff." The name made her smile. It seemed people would go to any lengths not to use the word rocket. Barby's husband used the more casual moniker of strap-on rockets. No matter what they called them, it was time to transition from firing rockets in the dry riverbed to firing rockets attached to a plane chained to the ground. August 1941 was a long string of early mornings for Barby. Waking up at 5 a.m., she dressed carefully in dresses or skirts, heels, and stockings. The men she worked with didn't bother with formalities and didn't worry about what they looked like, donning shirts without jackets or ties and pulling on comfortable boots. Barby, on the other hand, faithfully did her makeup each morning and smoothed the waves of her hair. Unless she preserved her curls by knotting a head scarf under her chin, they would soon be blown out on the gusty airfield. Whether wind or dust, it seemed she couldn't escape the elements. Before she and Richard left in the morning, they'd drink coffee in their rose-colored kitchen. As they talked about their work that day and their plans for the evening, Barby prepared herself mentally for the tasks ahead, knowing that emotions could be raw on the airfield. She let music calm her frazzled nerves, sometimes singing "Every Day's a Holiday" by Glenn Miller or "Boogie Woogie Bugle Boy" by the Andrews Sisters on her way to work. Dawn broke bold behind the foothills as she and Richard drove to March Field, a small airfield an hour east of Pasadena. The air was still, perfect for their experiments. By afternoon, the wind would pick up, whipping Barby's dresses around her knees and casting doubt on the success of their strap-on rockets. The early tests were riddled by failure. The same winds that caused Barby's hair to whip around her face also rattled the plane on the runway. They had set up a small airplane, broken off its propeller, and tethered it to the ground with chains. The engineers hoped these would steady the craft and limit accidents. The chains were there for safety because their rockets weren't yet ready to take the plane into flight. The plane they had tied down was an Ercoupe, a small singleseater with a low fixed wing covered in shiny aluminum. It weighed only 838 pounds and, after the war, had the distinction of being sold in the men's department at Macy's. The team secured the rocket engines, starting out with two on each side, directly onto the fuselage of the plane, ripping a ten-inch-wide hole in the skin underneath the wings to bolt it on. In the cockpit was Lieutenant Homer Boushey, a former student of von Kármán's, now an army pilot. It was up to him to ignite the engines filled with explosive-packed powder. The first time they ran the experiment, the rocket engine misfired. No one knew why. The second experiment was much worse. Four jet units were attached to the airplane, and one of them failed immediately. Its exhaust nozzle bounced down the runway, eventually striking the fuselage of the plane and tearing a large hole in its skin before shearing off one of the combustion chambers. That combustion chamber was thrown clear of the airplane, about a hundred feet. In a lab notebook, they wrote, "The blow was rather violent causing the rear attachment of the angle irons to pull loose and the dural wing covering immediately above the exhaust nozzle position to stretch, pulling loose 4–5 rivets." The group were shaken up by the accident. They had managed to rip apart what Ercoupe's advertisements proclaimed to be the "world's safest plane." At least no one was hurt. In addition to her notes on the experiments, notes similar to those every engineer recorded in a slim, brown lab notebook, Barby made long charts of numbers. She calculated the thrust produced by each rocket engine and how it corresponded to the flight results. She was looking for clues in the performance of the rocket engine — hidden data that might reveal how to get the plane to fly. With the airplane in pieces, the team worried that Boushey, the test pilot, would decide to leave. They weren't sure if they could find anyone else willing to fly for them. Luckily, Boushey decided to give it another go. Jack Parsons later noted: "The pilot deserves credit for his willingness to continue flight test as soon as the airplane was repaired." Over the next week, they repaired the plane and built a secure holster for the cylindrical bottle-shaped rockets. They even added two more rockets, bringing the count up to six. When the pilot got back into the cockpit, everyone was more than a little anxious. They pasted posters to the nose of the plane, demanding BE ALERT! DON'T GET HURT! The signs served as a reminder of their close call. Barby held her breath as the plane hovered in the air, pulling against its chains. That flight, only a few feet off the ground, was the first hint that the rocket plane they had once dreamed of might actually work. Four days later, on August 12, 1941, they took off the chains. The airfield was quiet. Barby spoke hardly a word. It seemed that all their hard work had been building toward this one experiment. Happily, the results matched their high expectations. The rockets were able to reduce by half the distance the plane needed to take off. As Boushey got out of the cockpit, he was grinning. It was exactly what the army needed, and it demonstrated that JPL could deliver. On that sunny day in August, the team took a photograph alongside the plane with its rockets strapped on. The petite aircraft would soon change the future of JPL. Standing on the airfield, Barby felt the cool touch of the metal plane on her warm skin. Even in the hottest part of the day the shell reflected heat back to the sky. Similar to the patchwork of parts that formed the rocket plane, the pieces of Barby's life had also come together in the past few months. The science classes she had taken, the risk in moving from Ohio, and even her unfulfilling work as a typist at Caltech had all culminated in this one accomplishment. Like Barby, the rocket plane was just beginning to show what it could do. Now that they had strapped six rockets onto it and watched it take off, it was time to push the limits. Although they were no longer called the Suicide Squad and their ranks had expanded slightly, they hadn't stopped taking risks. The next step was to attach twelve JATO units to see if the rockets alone could power a launch. When the small plane went airborne without the aid of a single propeller, it made the first American rocket-powered airplane flight. The timing could hardly have been better. Four months later, a rocket-powered plane would be urgently needed. The Canrights were enjoying a quiet Sunday afternoon on December 7, 1941. Barby was in the kitchen, cooking and listening to the radio, when the announcer interrupted the program with breaking news. The Japanese had attacked Pearl Harbor. Barby fell to the kitchen floor, tears streaming down her cheeks. The war had hit home. Hawaii suddenly seemed very close to California. Barby and Richard were glued to the radio for the rest of the evening. In their dark hour, Barby heard the first lady's potent voice on the broadcast. When Eleanor Roosevelt said, "We know what we have to face, and we know that we are ready to face it," Barby knew that their work would now take on a new importance. Going in to the lab the next day, they might have been talking about Pearl Harbor, but they were thinking about the rocket plane. But achieving a short runway launch with a trim Ercoupe was a relatively minor accomplishment. The army needed to lift a fourteen-thousand-pound bomber into the air. In one month, Barby filled more than twenty notebooks with rows of neatly printed numbers. Each column represented a value from the experiment, plugged into lines of exquisitely complex equations. One of the key computations Barby was responsible for was the thrust-to-weight ratio, an equation that allowed the group to compare the performance of the engines under different conditions. She repeated the calculation many times, sliding the numbers into the equation with the ease of slipping on a pair of shoes. It took just a year for the JPL rockets to boost the Douglas A-20A bomber into the air. They experimentally fired the JATO units on the heavy bomber forty-four times, the rockets needing only minor fixes. The project was a success. For the second time, Barby Canright's face beamed with pride as she stood next to the bomber. It was time to take the work out of the lab and bring the technology into production. Frank and von Kármán set up a company, Aerojet, to manufacture rockets while they continued their research in the Arroyo Seco. Money and success brought support for the ragtag group, and they made the California canyon their permanent home. All JPL needed now was more employees. Barby was excited when Frank told her he was hiring two more computers, a man and a woman, Freeman Kincaid and Melba Nead. Until then, Barby and Frank's secretary had been the only two women at the institute. Barby, who didn't spend much time with the secretary, had felt the lack of female companionship. Melba, on the other hand, was overwhelmed. Attending her first party at Jack and Helen Parsons' house, she felt shy among the group of people she barely knew. Perhaps sensing her reticence, an older gentleman came up to her. "I'm von Kármán," he said pleasantly, extending a hand. Melba took it, awed to meet the director of the lab. The intimate feel of the gathering soon swayed her. She mixed among the engineers and her fellow computers and began to feel at ease. of being female. Although she loved her work, with Richard's promotion and subsequent added income, she was thinking about starting a family. While they considered having children, Richard was launching something new at the lab. He was going to look at the performance of their rockets underwater. In preparation, the group dug a channel into the dirt near the test pits and filled it with water. The engineers sank their engines into the ditch, the water creeping into the engine and up the fuel line. The motor was only nine inches deep, yet it still looked hopelessly submerged to Barby. JPL was trying to develop what they called a hydrobomb. While it was essentially a torpedo, they didn't dare call it that. Only the navy was allowed to develop torpedoes. Richard and his team fired the engines, expecting them to sputter and die. Instead they worked just fine underwater. In no time at all Richard was leaving the channel behind and moving to a nearby lake where the motors could be submerged six feet deep. He'd bring back the data to his wife, excited for her analysis. Not long after Richard's promotion, JPL hired two more women, Virginia Prettyman and Macie Roberts, rounding out the computer room to a team of five: four women and one man. The new recruits didn't seem promising at first. Virginia and Macie, or Ginny and Bobby, as they soon became known, had never heard of a computer before. They answered the want ad with little idea of what they were getting themselves into. Despite the newcomers' naïveté, the computers immediately became good friends. They spent every day working together, sweating over their calculations, observing experiments in the test pits, and chatting with the engineers. And since their houses were practically next door to one another in Pasadena, they often ate dinner and relaxed together in the evenings. Most of the employees drove to the lab, occasionally carpooling. Freeman and Melba preferred the streetcar. They got off at Ventura Street, a stop that looked like a desolate canyon with a road running through it, then walked across a rickety bridge over the dry streambed to get to the office. At the site, there were only a few structures: an old barn, two small laboratories, a shop for liquid propellant, two hydraulic presses to shape the metal, and Building 11. Building 11 was the engineering building, and it sat right next to the test pits, which made up Buildings 5 through 7 and 10, although they were little more than shacks covering the pits in the ground where the rockets were fired. Building 11 was small but brand-new, with a conference room, a darkroom, and freshly painted offices for the engineers and computers. One side of the computer room was framed in windows, filling the space with California sunshine. Each of the computers had her or his own wooden desk, and when the sun hit them, they turned a golden hue. The room was never quiet. Between their large electric calculator, slide rules, and the general hum of conversation, the five computers made a lot of noise. But nothing was as loud as the noise from the test pits. It was so shocking that it often caused them to jump. Things only got worse when the field team decided to add a warning sound. For this, one of the mechanics pulled the cable of a Ford truck horn. The horn went "Aruugah!," making employees jump almost as high as when they heard the explosions themselves. Neither noise was popular with residents whose newly built homes were within earshot. For a little quiet, Melba sometimes walked down the hall. She would chat pleasantly with Frank's secretary, Dorothy Lewis, and then proceed into his small office to discuss data. Frank, all of twenty-nine years old, had just taken over the role as acting director of JPL. Von Kármán left the lab in 1944 to launch the air force's Scientific Advisory Group. His decision to leave set off a scuffle over the JPL directorship. Clark Millikan, professor of aeronautics at Caltech, was aching to take the reins of the fledgling institute. Despite Millikan's years of experience, von Kármán preferred to turn over the lab to his former student, who, although relatively untried, made up for it with his zeal for research. It must have been strange for Barby to watch Frank grow up in front of her eyes, moving from student to professor in a short period. By necessity he had to be serious now, at least most of the time. He still pulled pranks around the lab, but mostly late at night, when he had the grounds to himself. It was a rocky transition from carefree member of the Suicide Squad to leader of a major research institute. One day, Barby and the other computers at JPL watched with disbelief as Frank harshly disciplined one of the engineers. Whiling away time between JATO tests in Muroc, California, today Edwards Air Force base, Walter Powell was playing with a toy airplane. Frank was curt with him: "Put away the toy, Walt. It's not a playground." Walter was furious. For the first few years their work had always had an element of play. Now things were changing. When Frank went back to his office, Walter couldn't stop thinking about his rebuke. If Frank didn't take him seriously, he would make him listen. He grabbed a hatchet and stood outside Frank's office, holding it over his head. Letting out a yell, he brought the blade against the closed door. Once, twice, three times. Through the shredded wood of his office door, Frank could make out Walter's face, red with anger, and began to scream for help. A few men came running. They tried talking to Walter, but he was shaking with anger. One of the engineers was holding a pair of scissors and had an idea. He walked over to Walter and cut off his necktie. The hallway fell silent. Then laughter began to percolate through the group. Soon even Frank was laughing. Walter didn't laugh, but he dropped the hatchet. He was incredibly embarrassed. For a month, it was all anyone at the institute could talk about. Barby and Melba would act out the final dramatic scene, Barby playfully chasing Melba with a pair of scissors. It was a long time before Walter would wear a necktie to work again. To avoid future hatchet jobs, Frank personally did all the hiring. He was careful to build a dedicated staff as the institution expanded. After establishing the lab in the desolate canyon, he wanted to make sure the small group worked well together. Given their long hours, they had to be more than just co-workers to each other — they needed to resemble a family. The computer room worked as seamlessly as a machine, notebooks passed from desk to desk as the five colleagues spent their days transforming raw numbers into meaningful data. Their prize possession was a single Friden calculator. It looked nothing like the modern, sleek devices we're used to today that can perform hundreds of functions and sit in the palm of our hand. Instead, the calculator was the size of a bread box and heavy. When they first received the Friden, Barby was excited to be in command of a machine that so few people knew how to use. It was the latest technology and much faster than a slide rule, though it could only add, subtract, multiply, and divide. It was a dull gray and looked like a typewriter, but instead of letters, the keyboard held rows of repeating numbers, from 0 to 9. Advertisements for the calculator boasted that with a "flick of the key" the Friden could "automatically transfer products from dials to keyboard." Only once the numbers were typed into each individual column could the "fully automatic" calculations begin. The calculator dispensed a small piece of paper showing the equation and its solution at the top of the machine, like a sheet of paper in a typewriter. Looking at the complex contraption now, it's hard to believe that it was able to perform only simple functions. Of course these simple functions were just the tip of the iceberg — Barby and the other computers had to do everything else by hand. Their fingers became rough with calluses from gripping a pencil eight hours a day. Barby was no longer calculating how many rockets were needed to lift a bomber into the sky. With that project completed, the group turned back to trying to pierce the edges of space. They had to find a way to propel a rocket to an altitude higher than that achieved by a simple helium-filled balloon. To devise the perfect motor, the engineers and computers had to solve four equations describing the relationship between the motor's physical properties and their rates of change. As the group worked together, it became clear from their calculations that they would need to focus on propellants. Melba, Macie, Virginia, Freeman, and Barby were responsible for calculating the potential of rocket propellants. Macie, perhaps because she was twenty years older than her fellow computers and obsessed with using precise terminology, would get annoyed if someone mistakenly called a rocket propellant "fuel." She had come to engineering late in life, after working as an auditor for the Internal Revenue Service, and so had taken her lessons in rocket science to heart. In her strict and proper way she would gently remind the transgressor that a propellant is not composed of fuel alone. It also includes an oxidizer, an element such as oxygen that is able to accept an electron, thus setting in motion a powerful oxidation-reduction reaction, often called a redox reaction. These reactions, in which electrons are transferred, create energy whether they occur in a rocket engine or in a cell in the human body. Fuels can't burn without an oxidizer like oxygen. Oxygen's powerful pull on electrons, those tiny particles with a negative charge, is needed for the fuel to combust. This is important, because if rockets were eventually to travel to space, where there is no oxygen, they would have to carry their own oxidizer. Virginia and Barby sat outside eating their lunch one day. Virginia was complimenting Barby's new hairstyle: "The short bangs are so cute. You look just like Bette Davis." Barby thanked her, running a finger through her new stylish bangs and carefully patting the tapered hair curling in at the nape of her neck. That day she was feeling especially pretty in a bright white shirtdress cinched tight at the waist and white pumps. They were taking a picture of everyone who worked at the lab, and she wanted to look her best. The white was a mild act of defiance for Barby, her stand against the dust that whipped around the canyon. As they talked about hairstyles, Barby brought the conversation back to the propellants they discussed in the computer room. "I hear Jack has an idea for a new one," she said, recalling her conversation with Richard the night before. "You're not going to believe what it's made of — asphalt." Virginia shook her head. "That sounds like Jack," she said. As crazy as it sounded to use the heavy asphalt that paved roads, no one knew what would best make rockets fly, so everything was fair game. At JPL, the team tested a wide range of solid, liquid, and gas options. They loaded the fuel and oxidizers into rocket motors that were housed in the test pits in a dirt field. These were directly adjacent to a handful of permanent buildings and the row of tar-paper shacks that made up the lab. Then they fired them. Gauges on the motors measured how fast the exhaust gas left the rocket motor and how the mass of the propellant changed over the course of the test. Technicians took pictures of the gauges after every test and brought the film to the darkroom in Building 11. In the darkroom, Barby, Melba, Macie, Virginia, and Freeman hovered over the photos of the gauges in the dim light and carefully recorded the data on blue graph paper. They'd bring their notebooks back to the computer room and begin work. By measuring how quickly the exhaust left the rocket engine, the computers could analyze how much force was generated from each experiment. From the raw data, they calculated by hand the thrust (the force propelling the rocket forward), the rate of combustion, and the velocity (the combined speed and direction). After noting these values in their brown notebooks, they plugged them into the Friden calculator and triple-checked them with a slide rule. Melba preferred the simple, straightforward nature of the slide rule. It looked like a ruler, but by placing the pointer at one number and sliding the middle section of the ruler into the proper position, they could use it for multiplication, division, square roots, and even trigonometry. It took Melba years to feel as comfortable with the Friden as she did with her slide rule. These calculations could not be done quickly, since they were all done by hand. It took only seconds for a rocket engine to be fired, but analyzing that one experiment could take a week or more for the human computers. Notebooks quickly accumulated, often six to eight of them for each experiment. Barby liked to stack them on her desk, forming a wall of paper. As the notebooks piled up, so did her feeling of accomplishment. Then, at the end of the experiment, after the final report was written up, she'd clear the notebooks off her desk. On a mild autumn morning, Barby and Macie were eager to begin analyzing the first experiments using asphalt as a base in the rocket fuel. The computers had been whispering about it for months. Only part of the gossip was about the fuel itself. No one had ever tested asphalt before, it was true, but the engineer who thought it up was also a curiosity. Barby had been friends with Jack and his wife, Helen, from the early days of the Suicide Squad. Jack was brilliant, but also eccentric. It wasn't until he met Frank that his genius began to shine. He was always coming up with quirky solutions to their engineering challenges. His engineering designs weren't the only unusual thing about him. Jack and Helen were often gossiped about at work. Jack talked about science fiction stories as if they were real, and he had separated from Helen after joining a bizarre, cultlike religion. Although Jack was by far JPL's most peculiar employee, they were thankful to have his rocket-fuel genius. The new propellant that Barby and Macie were excited about was a unique mixture of liquefied asphalt with a potassium perchlorate oxidizer. The computers still had to figure out what proportions of fuel and oxidizer were needed to work in a rocket. The best mixture, they calculated, was 70 percent Texaco No. 18 asphalt combined with 30 percent Union Oil lubricating oil. The technicians liquefied the asphalt-oil combination by heating it to 275 degrees Fahrenheit and then added crushed potassium perchlorate. The propellant was mixed and allowed to cool, becoming a solid round block, a cake of rocket-blasting power. They called it Jack's cake. The technicians and engineers packed the black powder cake tightly inside the combustion chamber of an engine lying at the bottom of one of the test pits. The engine looked like a dirty, rolled-up newspaper. A clay nozzle lay at one end, connecting the propellant with the igniter. On the other end of the engine lay the charge, which emitted a smoke trail, so they could follow the exhaust as it flew down the test pit. The engine, anchored in the test pit, was under intense pressure, and when it was ignited, the ground shook. Seconds later the exhaust hit the hillside, and huge clouds of white smoke made of potassium chloride, a by-product of the propellant, rose from the pit. The computers collected their data from the gauges on the engine and then began to calculate. Their goal was a lofty one: they were trying to find a propellant that could deliver a thrust of 1,000 pounds over the course of ten to thirty seconds. No powder rocket had ever accomplished such a feat. At JPL they weren't sure it was even possible. Most of the tests of black-powder propellant ended in explosions. The seals of the engine failed or the charges cracked and the whole thing burst into flames. Jack's cake, however, was different. The computers found that Jack's unusual propellant had a specific impulse of 186 and an exhaust velocity of 5,900 feet per second. It delivered a formidable 200 pounds of thrust. It was exactly the kind of fuel the military needed, because it was powerful yet used common (and cheap) ingredients that could be stored at a wide range of temperatures. Almost immediately Barby saw her work finding its way into rockets owned by the U.S. Navy. The work was secret, the reports classified. It was still wartime, and rocket research concentrated on military applications, not scientific exploration. For some, the war felt like an interruption. In the words of Suicide Squad member Ed Forman, "Our dreams of designing rockets for scientific research at high altitudes and for space flight had to be deferred for several years." On the other hand, without the war effort, JPL might never have existed at all. Started with pocket money that was quickly used up, it survived solely because of military funding. For Barby's part, she was proud to be part of the war effort. Frank shared her feelings, writing home, "Some of the gadgets we helped to develop saved several lives in the Pacific recently." California's location — uncomfortably close to Pearl Harbor — stirred fear in its residents. Newspapers discussed the probability that Japan would attack California, and Japanese Americans were being rounded up and sent to internment camps. The need for military might was clear. In this atmosphere, the human computers at JPL lost their only male member, Freeman Kincaid, who joined the Merchant Marine, an auxiliary group to the navy during wartime. His departure, and the small pool of male candidates who might replace him, made the group distinctly female. Whether they worked for the military or for themselves, JPL was unwaveringly pursuing rockets, still the subject of many jokes in the outside world, and ready to move beyond the strap-on rockets used to lift bombers. The group wanted to design missiles, but there was still the problem of propellants. They might have created an exceptional military solid propellant, but it was unknown whether liquid propellants could provide more thrust. The group divided in two: the solid and liquid propellant sections. The computers crossed borders, working with engineers in both sections. In weekly lab meetings, they all came together to apply their expertise and share their results. in addition to assuming a manager's responsibilities. Macie was a natural for the job. She was the mother hen, and was interested in building not just a team, but a family. Because of her, the computing section at JPL would be entirely composed of women. As Macie was rising in the ranks of JPL, Barby saw her future at the institute faltering. She was pregnant. It was getting harder and harder to conceal her growing belly at work, and she knew that soon she'd have to quit. There was no such thing as maternity leave. She was thrilled to be having a baby but sad to say good-bye to the group she'd been a part of since its birth. The computers stood in the crowd at the Tournament of Roses Parade on a clear New Year's Day, 1943. In 1942 the event had moved, for the only time in its history, to North Carolina, in a preemptive effort to spare it from possible attacks on the West Coast. Now the parade was back in Pasadena, where it belonged. As girls in pastel crinoline dresses slowly waved from their floats, Macie recognized one of the princesses: a mathematics student at Pasadena Junior College. The girl hadn't planned to be in the parade, but tryouts for the Tournament of Roses Royal Court were mandatory for every girl older than seventeen enrolled in women's physical education classes, a requirement. Even if they had no interest in participating, each was required to walk up a flight of stairs and across a stage while a panel of judges appraised her figure, beauty, and grace. Macie smiled at the sight of this young girl, gifted in math, riding atop a float. She wondered what opportunities awaited her. With Macie to lead them, a group of young women were about to leave the lives expected of them. Each would go from being an oddity in school, one of only a few girls who flourished in calculus and chemistry classes, to joining a unique group of women at JPL. The careers they were about to launch would be unlike any other. In accordance with the U.S. Copyright Act of 1976, the scanning, uploading, and electronic sharing of any part of this book without the permission of the publisher constitute unlawful piracy and theft of the author's intellectual property. If you would like to use material from the book (other than for review purposes), prior written permission must be obtained by contacting the publisher at permissions@hbgusa.com. Thank you for your support of the author's rights.Little, Brown and Company is a division of Hachette Book Group, Inc. The Little, Brown name and logo are trademarks of Hachette Book Group, Inc.The publisher is not responsible for websites (or their content) that are not owned by the publisher.